Click on the titles of the databases/books/articles to open them. Remember, from home you will need a username and password for access! This database contains nearly a million biographies from across the world and spanning all of history. Biographies are updated daily and include content from multiple reference sources including, but not limited to American Men & Women of Science, Encyclopaedia Judaica, Governments of the World, and the Encyclopedia of African-American Culture and History. Try searching for any historical figures (for example, al-Musta'sim), or historians here! This database has a great topic overview of the Mongol Empire. Find it by searching "Mongol Empire" in the search box and then clicking on "Topics." Be sure to look at the links on the left side of the article to click through the different parts of the overview. The article discusses many segments of life in the Mongol empire as well as food, medicine, warfare, women's lives, etc as well as letters from Marco Polo! Be sure to click the down arrows and check out the many links so you don't miss out on some great info! This database includes world history from pre-history to 1500AD and includes articles, activities, discussions, media & visuals, and glossary terms for eras that are available for exploration. Also includes cultural documents as well as ideas and movements. Try searching historical topics like The Mongol Empire, The Silk Road, etc. 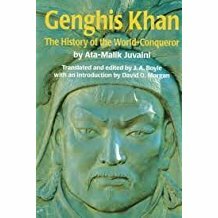 in addition to major historical figures like Genghis Khan, Kublai Khan, etc. ​Includes access to all issues of National Geographic from 1888 to the present, People, Animals, and the World database access, and National Geographic for Kids. Also includes access to books published by National Geographic. Edwards, Mike, and James L. Stanfield. "Lord of the Mongols, Genghis Khan." National Geographic Magazine, Dec. 1996, p. +. National Geographic Virtual Library, tinyurl.galegroup.com/tinyurl/5U6569. Accessed 6 Nov. 2017. ​Magazine, Dec. 1996, p. . National Geographic Virtual Library, tinyurl.galegroup.com/tinyurl/5U6B59. Accessed 6 Nov. 2017. Available through Google Books. Try searching within the book for "Ala ad-Din Muhammad II." Available through Google Books. Read the Translator's note or search within the book for "Juvaini."